Causes of Deck Collapse – Is Your Vinyl Deck at Risk? We see the headlines, but we rarely connect the fact that deck collapses happen more often than we think. During National Deck Safety Month, Tuff Industries wants to help homeowners understand the causes and ensure that their vinyl deck is safe. Approximately 672 people in the U.S. suffer an injury each year due to deck collapse, but the number of failures is considered much higher as many people do not report their deck collapse. So how do you know if your waterproof deck is in danger? For every deck collapse on the news, there are tens more that go unnoticed by the media. There is also no centralized data of deck collapses or underlying causes in the United States or Canada, making it difficult to point to reasons behind collapses or to indicate a trend in causes of deck failure. A Legacy Services report from 2010 indicates that nearly 15 percent of injuries due to deck collapse are caused by structural failure. When buying a home with an attached deck, there is a notion that “if it’s built, it must be okay.” The truth is, you have no idea who built the deck and their qualifications. You also don’t know if proper deck building codes and practices were in place. Although safety codes for deck building have improved since 2009, decks built earlier (or those built without permit or inspection) have no such requirements. Additionally, decks that are safe to begin with do not stay that way indefinitely. The lifespan of a deck varies depending on many factors. 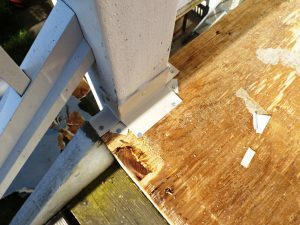 Homeowners should pay attention to decks in the 15 to 20 year or older mark, as they may be beginning to show signs of structural rot or other types of degradation. Unless you are selling or buying a hoe, or installing an addition, there’s no legal requirement for a deck inspection. Deck structures could go years, even decades, without a structural inspection. Meanwhile, new decks are not always built to the revised building standards, leaving homeowners open to risk. Even if your deck appears to be in great shape, underlying water seepage or poor attachment could cause deck failure. In addition to a full inspection prior to the purchase of a home, a deck should be regularly inspected to catch problems before they cause major issues. Decks that don’t meet new structural requirements require upgrades – period. In many cases, you may just need to attach the deck to the structure, or ledger, with better hardware. As previous building codes for decks merely required the use of nails, this increases the safety of your vinyl deck. Other upgrades include ensuring that there is flashing protecting the deck ledger from water damage and rot. You can also update vinyl membranes to protect the surrounding structure from water damage. As new building codes have evolved, the cost to install new decks has likewise increased. The temptation to choose a less expensive deck installation company can be hard to resist. Homeowners should be cautious as many contractors save money by using unapproved building practices or skimping on hardware, increasing the risk of deck failure. A Tufdek™ certified vinyl waterproof deck builder can help ensure that your deck is safe, secure, and long-lasting.